As the Book of Wisdom foretold, it is only in the eyes of the foolish that our beloved deceased are dead; that their passing away is considered an affliction, “their going forth from us utter destruction.” (Wisdom 3:2-3). As St. Paul reminds us, “God will bring forth with Him from the dead those also who have fallen asleep believing in Him.” (1 Thessalonians 4:14). Because we are a people of faith in the promises of Our Lord Jesus Christ, we celebrate with the ancient rituals of the Church the passing of our beloved deceased from this life into the full presence of God. These rituals have taken shape through the expressions of faith that have grown over the two millennia of Christian witness. It is our hope that these guidelines will assist you in planning the elements of the rituals to be employed in the funeral services for your loved one. Please read through these guidelines carefully. Members of our parish Comfort Ministry as well as the parish staff are available to assist you if you have any questions, concerns or special needs. A VIGIL SERVICE of prayers, readings from Scripture and intercessions may be offered during the viewing of the body if this will take place the evening before the funeral Mass/burial. A MASS OF CHRISTIAN BURIAL is celebrated the day the body is to be buried (unless cremated remains will be interred on another day). All baptized Roman Catholics are entitled to a full Mass of Christian Burial, regardless of the level of faithfulness to church practice by the deceased or their families. Only those under an official edict of censure by the local bishop or the Pope may not receive a Funeral Mass. In such an extreme case, a Funeral Service Outside of the Mass may be celebrated with the permission of the local bishop. A RITE OF COMMITTAL is prayers offered at the graveside (or place of internment). 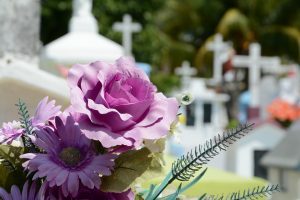 A custom growing in popularity is to have a viewing of the body (either at a funeral home or in the church) followed immediately by the funeral Mass and burial. In this case, there is no vigil prayer service. As with weddings, music for funeral liturgies must be approved for church use. Most secular music is not permitted. One of our Comfort Ministers will be contacted to help the bereaved family prepare for the funeral service. You will be visited by one of the comfort ministers of our parish community who wish to express our condolences as well as assist you in the planning of the services for your loved one. 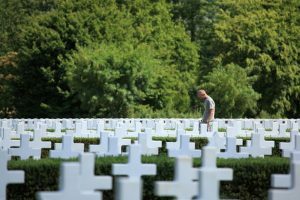 From a Catholic perspective, you may choose one of the following options: A Vigil Service during the viewing of the body of your loved one at the Funeral Home on the evening before burial, and a Funeral liturgy at the Church followed by internment at the cemetery or mausoleum. Cremation of the body is an acceptable practice among Catholic faithful. However, the teaching of the Church still clearly prefers the burial or internment of the body as more in keeping with the dignity of the human body as a temple of the Holy Spirit; a body that was washed and anointed in Baptism and Confirmation, fed with the Body and Blood of Christ, and anointed in Sacrament of the Sick. If possible, cremation should occur sometime after the Funeral Mass and the remains interred at a later time. However, cremated remains may be present at the Funeral Mass and interred afterward. In keeping with respect for the human body, cremated remains are to be buried or interred in a proper cemetery. They are not to be kept in homes or sprinkled over land or water. 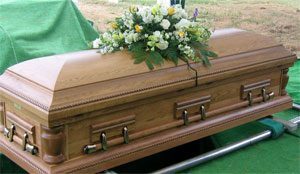 If there is to be a viewing of your loved one’s body or a gathering in the presence of the body in a closed casket, you have the option of gathering at the Funeral Home on the evening before burial. A priest, deacon, or lay minister will lead a brief service of prayers, Scripture readings and intercessions at some point during the gathering. A eulogy may also be given at this time. If the viewing or gathering will take place in the Funeral Home on the day of burial prior to the funeral liturgy, the Vigil Service is not conducted. Likewise, there is no Vigil Service if the viewing/gathering takes place at the Church. If the body of your loved one is to be cremated prior to services, there is no Vigil Service. All baptized Roman Catholics are entitled to a full Mass of Christian Burial, regardless of the level of faithfulness to Church practice by the deceased or their families. Only those under an official edict of censure by the local bishop or the Pope may not receive a Funeral Mass. In such an extreme case, a Funeral Service Outside of the Mass may be celebrated with the permission of the local Bishop. We encourage the family of the deceased to take an active role in planning the elements of the Mass. You will receive a booklet containing the various Scripture readings, prayers, and intercessions used in a funeral Mass. Please take some time to read through it, and choose those elements you feel would be the most appropriate for the occasion. You may list your selections on the form included with the booklet. The comfort minister will help you with your selections and inform the rectory staff of them for you. We request that you choose: an Opening Prayer (see pp. 18-38); an Old Testament reading (pp. 40-46); a Responsorial Psalm (pp. 47-56); a New Testament reading (pp. 56-67); a Gospel (pp. 70-85); and a set of General Intercessions (pp. 86-104). Capable family members or friends are invited to proclaim the Old and New Testament readings and General Intercessions. The Psalm is led by a Cantor (see Music Guidelines below). A deacon or priest reads the Gospel. Scripture readings are proclaimed from the Lectionary (the Church’s official collection of readings from the Bible), not from pages torn out of a book or photocopies. One of the comfort ministers will assist the readers in locating their reading in the Lectionary. Therefore, it would be helpful if your readers arrive at least 10 minutes before the funeral liturgy begins. If you opt not to choose readers for the liturgy, the comfort ministers are happy to proclaim the readings on your behalf. At the beginning of the Mass, when the body of the deceased is greeted at the door of the Church, the casket is sprinkled with holy water and a large white cloth called a pall is draped over it. These actions are reminders of baptism (the pall, reminiscent of the white clothing worn by the newly baptized); for it is by baptism that your loved one shares in Christ’s victory over sin and death. Family members or friends are invited to place the pall over the casket. If none feel capable, the funeral director will fulfill this ritual. A family member or friend may also place either a cross, Bible or Gospel Book on the casket after the pall has been draped over it, as a sign that your loved one was, indeed, a follower of Christ. NB If the body of your loved one is cremated prior to the funeral liturgy, the urn containing the remains may be brought into the Church by a family member or friend, or they may be positioned in a place of honor near the Sanctuary before Mass begins. In either case, the pall is not used. Two or three family members or friends of the deceased are also invited to bring forward the gifts of bread and wine, which will become the Body and Blood of Christ. Please note that there is no presentation of symbolic gifts at this time. If there are any special mementos of your loved one you would like to have displayed, we will be happy to arrange them in an appropriate manner for you. A family member or friend of the deceased may offer a eulogy following the Communion rite. Please inform the comfort minister who will deliver it. The priest will invite the person forward at the appropriate time. We ask that there be only one eulogy delivered at this time. If other persons desire to offer some words, you might consider having them delivered during the viewing or at the graveside. Music affects our feelings and the atmosphere in which we pray. It expresses our thoughts, hopes and desires. It has the power to console and uplift us, while strengthening the unity of the assembly in faith and love. Because it is an integral, that is not optional, part of Catholic worship, music should always be incorporated into a Funeral liturgy. Rather than melodies that emphasize the sadness of the death experience, we encourage the selection of music that is more uplifting and consoling, expressing our faith in the Lord’s triumph over death and His sharing of that victory with your loved one. Our comfort ministers will be pleased to guide you in choosing appropriate music for the celebration of the funeral liturgy. The funeral director will make arrangements for an instrumentalist and cantor/leader of song. Since they are familiar with our parish procedures, we prefer to employ our own parish music ministers. Only those who are trained Catholic liturgical ministers are permitted to provide music for funerals at Our Lady of Perpetual Help Parish. There is a wealth of Gospel/Spiritual music from which you may choose, depending on the music ministers’ repertoire. We regret, however, that popular music (Wind Beneath My Wings, O Danny Boy, etc.) may not be employed for a funeral liturgy, but may be appropriate during the viewing or at the graveside. This ritual is conducted at the time of burial. It consists of a series of brief prayers and intercessions, and usually takes place immediately after the Funeral Mass. If cremation is to take place after the funeral services, the Rite of Committal takes place at another time. Please note that Catholic teaching calls for cremated remains to be buried or interred in keeping with the dignified treatment of human remains. They are not to be kept in a home or sprinkled over land or bodies of water.